Let the games begin. Again. Valve has whipped the Portal community into a fresh frenzy with one more update to the PC version of the first-person puzzle game. What does the the developer have in store this time? Officially, it has "Added valuable asset retrieval." So... there you go? No new achievements, but the Steam forum community is currently chipping away at the new update to see if Valve has more potential Portal 2 or Half-Life 2: Episode Three teasers in buried within. Either that or one of the newly added sound files is a recording of Justin Long saying "I'm a Mac" backmasked, slowed down and run through some World War II era Japanese encryption code. Earlier this week, Valve added a series of new radio transmissions and one new Steam achievement, resulting in a multi-layered puzzle that resulted in some very interesting findings. We're keeping an eye on the latest developments and will update this post when appropriate. 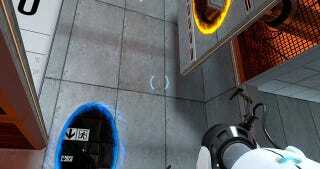 Update: Valve has changed the ending of Portal. Watch it here.